Since we are moving into late fall, travel tends to take a back seat for many Vagabonds. Although, I must admit, we have many places on our Travel Bucket List that we must see before someone puts our coffee can of ashes next to our BFF under our favorite rock. I still want to see Rockefeller Center when they light the tree, see a real bullfight in Andalucía and listen to Beethoven's Fifth in the Musikverein Vienna, to name a few. In addition, this time of year, many travel to see family and/or friends they haven't seen since the last time they all gathered in one place. Depending on your point of view, your annul travel over the river and through the woods can be a delight or another exercise in overeating and the long road back. But I say we need to enjoy these connections more. In the bizzaro world we currently live in, we need to draw as close as possible to blood, even if we find Uncle Ed a bit tedious or Aunt Louise a tad scary. So I thought I would share a quick story from our travel escapades that may, at first glance, seem rather pedestrian, but, upon closer inspection, lends meaning to the connections we make through travel. We had started our trip to Provence in the great city of Paris three days earlier. 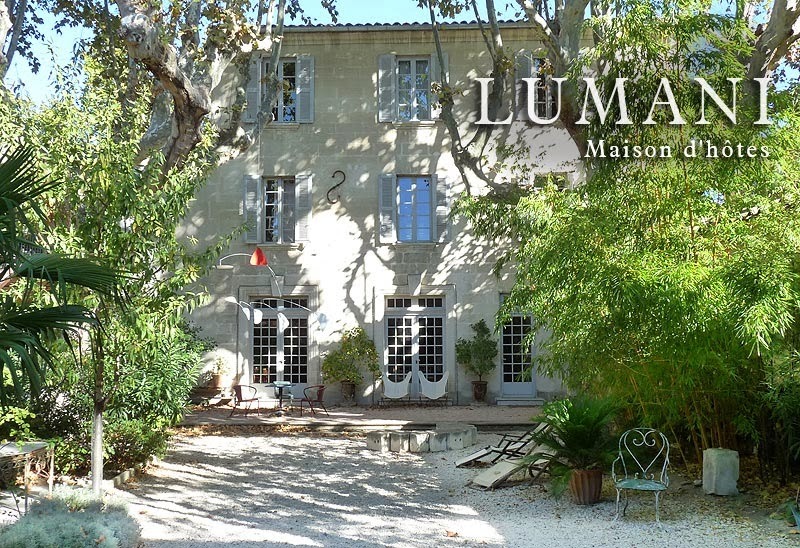 After a cloud like train trip on the high speed TGV, we arrived in the former city of popes - Avignon - picked up a car, got lost several times and arrived in mid afternoon at the utterly delightful and creatively repurposed manor house Lumani. After settling in, we decided to take a stroll in the old town center and purchase some cheese and bread, wine and fruit for a late afternoon snack. In addition, we had to purchase a knife to cut our locally produced goodies. The Lumani is designed around an immense, yet intimate courtyard complete with sculpture, comfortable chairs and tables and a small fountain. In addition, it gave us protection from the famous mistral winds that blow during certain times of the year in Provence. As we enjoyed our afternoon meal and talked in broken English and French with the artist wife of the duo that owned this fascinating little hotel, the travel of the day finally caught up with us and we retired early to our well appointed room for a long night's sleep. The important part of this story, of course, is the knife. Even now, some years later, this rather unimpressive kitchen implement plays a roll in our daily lives. It's not what one would expect to find interesting. It has a black plastic handle with a small serrated blade. We use it daily to cut everything from tomatoes to last night's left over sirloin for a homemade steak salad. But here's the point (pardon the pun) - Every time I pick up this little utilitarian kitchen utensil, purchased in the romantic city of Avignon, I think about that afternoon in the courtyard with the winds outside, the artwork, the comfortable table and the conversations with one of the people that created this small enclave of design elegance next to the original fortress wall in one of the most fascinating cities in Europe. Though mundane in every sense of the word, it provides the same sensory connection to the joys of travel that any work of art or other, more refined, artifact from another faraway place. Call me weird, if you like, but this small daily reminder of the joys of travel and the uniqueness of a culture somehow doesn't seem weird, but seems completely relevant. So next time you look at some something that you picked up in Madagascar or San Jose, allow those memories of travel to rush back into your consciousness. If nothing else it will take you to a place that you just know you need to go - and soon.